Your bump has grown enormously and you may notice you can no longer eat large portions. It is your baby that fills the space. A solution to this is to spread many small mealtimes throughout the day. Instead of three, take five smaller ones. Often you will need to pass urine more frequently so sitting through a movie at the cinema is probably not achievable or making it to the interval at the theatre. 34 weeks pregnant – how is your baby growing? Your baby is now approximately 42 centimetres long and weighs about 2300 grams. The eyes are completely functional which means your baby can distinquish between dark and light. 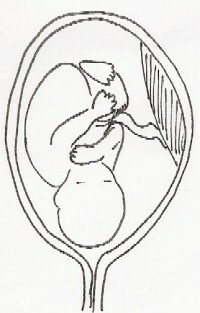 In week 34 the lungs are sufficiently developed to enable the baby to survive outside the uterus. If your baby would be born now he has 99% chance of survival. Whether your child would need an incubator depends on his weight.